RBM Valley evokes charm and character. It has the best of facilities for every member of your family to have a great time. From a Rooftop AC Community Hall to a Games Room, AC Multi-gym and Children’s play Area. You have the assurance of Bengal RBM Promoters. 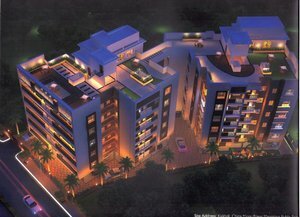 Led by people with years of experience in the field and successfully developing several prestigious housing projects in North kolkata and its adjoining areas. Location:- RBM Valley’s appeal is perfectly complemented by its location. Situated a stone throw away from the international airport, it is conveniently located close to major school, colleges, It hubs and offices, hospitals and malls. Rooftop AC Community Hall, Rooftop AC Gymnasium, Rooftop Indoor Games Room, Children’s Park, 24hr. Power Back-up, 24hr. Water Supply,24hr. Security with CCTV Camera,24hr. Wi-Fi System, Intercom, Fire Hydrant System, Transformer, Car Parking, Elevator, Water Filtration Plan, Servent Toilet on Ground Floor.